Every day or two, Thoreau goes to the village to hear the gossip, which he finds refreshing, like the sound of the leaves or frogs. He describes the village as a home of certain kinds of animals, just as the woods are. Walking through the village is like running the gauntlet, he says, with people from every direction trying to talk to you and draw you into their shops, and sometimes Thoreau escapes quickly back into the woods, sometimes very late at night, when he has to find his way back blindly. Getting lost in the woods makes one appreciate "the vastness and strangeness of nature," he says. Thoreau's way of enjoying the society of the village is to think of it as just another part of nature. He describes the gossip of the villagers not in terms of what they said, but in terms of the sounds they made, like the sounds of the leaves or frogs. When the village is overwhelming, he retreats into his natural home, familiar even as it is strange. One afternoon, when Thoreau was in the village, he says, he was apprehended by the police and put in jail for refusing to pay a tax. He decided not to flee, but to let the state do harm to him, and he was released the next day. He describes the incident as just another one of society's institutions getting in the way of his life. In fact, he says, he was never harassed by anyone except by someone acting on behalf of the state. Never was he the target of thievery, which, he says, would disappear if all men lived as simply as he does. Thoreau's decision to isolate himself from society is not just a philosophical choice. It's also political, signifying a distrust in all forms of institutions, which are forms of society's excesses. Saviano, Andrew. "Walden The Village." LitCharts. LitCharts LLC, 15 Sep 2013. Web. 29 Jan 2019. Saviano, Andrew. "Walden The Village." LitCharts LLC, September 15, 2013. 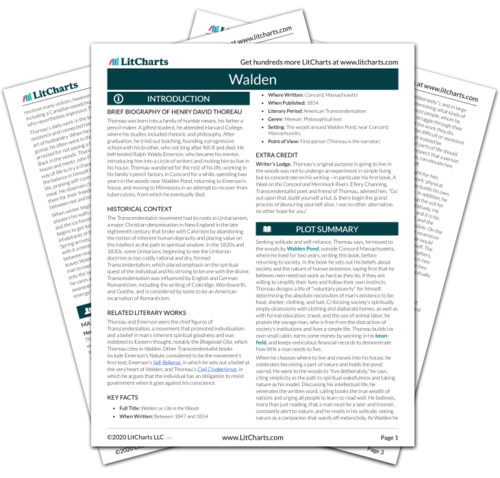 Retrieved January 29, 2019. https://www.litcharts.com/lit/walden/the-village.